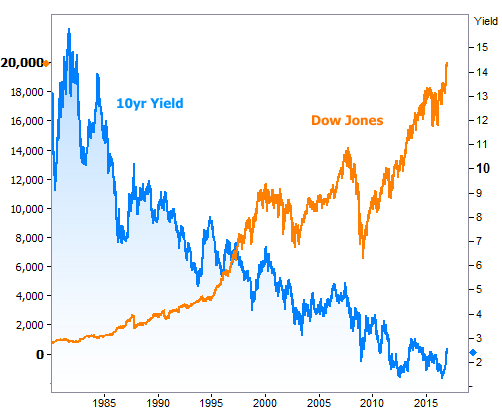 Does "Dow 20k" Matter For Rates/Housing? As the new year gets underway, news stories about the Dow Jones Industrial Average hitting the 20,000 level are hard to miss. Given that stocks and rates moved higher together after the election, it's fair to wonder how this correlation might affect rates and housing. There's no one-size-fits-all approach to this complex issue, but there are a few easy observations. First, let's address the conventional wisdom regarding stocks' and bonds' (the securities that drive "rates") correlation. This is easy to test with a quick glance at the long-term chart. We'll use the most quintessential benchmarks for stocks and rates: the Dow and the 10yr Treasury yield. Remember, conventional wisdom says the blue and orange lines should be on top of each other, for the most part. So what's going on here? How can stocks and bonds be telling such different stories depending on the frame of reference? The answer is simply that stocks and bonds do indeed tend to go through phases of high correlation in the shorter term. The shorter the time frame, the more reasonable it is to expect correlation. This fits with the conventional wisdom of investors moving money out of one sector and into another (i.e. "buy stocks, sell bonds!"). The correlation breaks down in the longer-term because rates are cyclical. That means they tend to cycle in a confined range. Even though that range is up for debate (after all, some countries have seen their 10yr rates drop below 0%), its cyclical nature is not. No one expects the 10yr yield to break its ceiling from the early 80's--not even close. Stocks, on the other hand, can theoretically maintain linear, or even exponential growth forever and ever. Only the most apocalyptic scenario would bring stocks back to early 80's levels. To oversimplify the point, the 30 biggest companies in the US would have to lose 90% of their value. Not even the most pessimistic forecasters would entertain such a possibility. Bottom line: stocks can keep moving higher over time if companies keep growing. Rates, on the other hand, can only go so high before economic and monetary forces will act to bring them back down. The big, unanswerable question is "how high will rates go this time around?" Some say that the decades-long trend toward lower rates over, and the new long term trend will be toward higher rates. Before you lose sleep over that, let's look at the scale of the problem. The following chart will help. The post-election rate spike is circled so you can see where it fits in, longer-term. To be clear, the recent rate spike was absolutely abrupt, but several past rate spikes covered much more distance overall. Additionally, the current rate spike hasn't even come close to definitively breaking the ceiling of the trend (the upper of the two parallel lines). That's not to say the trend won't break. Naturally, if the trend is downwardly-sloped, and if I just argued that rates will hold a cyclical/sideways pattern in the longest of terms, the trend must be defeated at some point. The only thing that's debatable is HOW that process will unfold: quickly and painfully, or slowly and tolerably? Late 2016 rate movements were defending against a "quick and painful" scenario where Trump's new policies stoked the fires of economic growth and inflation (both bad for rates) which in turn would prompt the Fed to raise rates more quickly (thus adding upward pressure on longer-term rates like mortgages). The Fed confirmed that assumption in the release of their December meeting minutes this week, saying that rates could need to be raised more quickly to whatever extent new fiscal policies were successful in promoting growth and inflation. But rates fell in response, suggesting markets already assumed as much, and that mid-December marked a near-term ceiling. From here, it continues to be the case that we're waiting to see how Trump's policies evolve and how much of an effect they ultimately have on growth and inflation. With December's highs hopefully behind us, rates are more likely to carve out a sideways range as they wait for the next major cue. That range could be fairly wide, given the scope of the movement over 2 months. "Pivot points" seen in the following chart can help us keep an eye on how rates are doing. In general, breaking below these pivot points is good, but such breaks can also serve as cues for markets to push back in the other direction, as seems to have been the case this week when 10yr yields hit 2.34% and promptly bounced back to 2.42%.